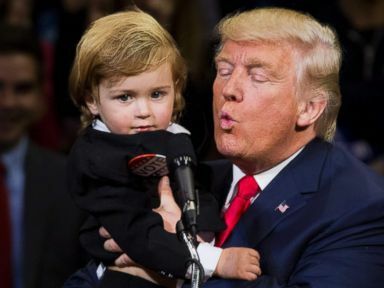 A moment of unexpected cuteness broke out at Donald Trump‘s rally Monday night in Pennsylvania, as a miniature doppelgänger emerged from the crowd and delighted the audience. During a pause in his speech in Wilkes-Barre, Trump appeared to notice the youngster and pointed him out. “Look at that guy over there!” Trump said, according to local ABC affiliate WNEP. “Bring him up!” the crowd began chanting. The boy — sporting a dark suit with a large “Vote” button, a white shirt and a red tie — was passed up to the stage and Trump carried him to the podium. To complete the look, the boy had a mop of blond hair that appeared to be done up in a nod to Trump’s signature comb-over. “Now, he’s supposed to look like Donald Trump, but he’s actually much too good looking,” Trump said. The GOP candidate asked him if he wanted to go back with his parents, or stay with Donald Trump. “Trump!” the boy said, bringing down the house.